Fat deposits in chickens contribute significantly to meat quality attributes such as juiciness, flavor, taste and other organoleptic properties. The quantity of fat deposited increases faster and earlier in the fast-growing chickens than in slow-growing chickens. In this study, Affymetrix Genechip® Chicken Genome Arrays 32773 transcripts were used to compare gene expression profiles in liver and hypothalamus tissues of fast-growing and slow-growing chicken at 8 wk of age. Real-time RT-PCR was used to validate the differential expression of genes selected from the microarray analysis. The mRNA expression of the genes was further examined in fat tissues. The association of single nucleotide polymorphisms of four lipid-related genes with fat traits was examined in a F2 resource population. Four hundred genes in the liver tissues and 220 genes hypothalamus tissues, respectively, were identified to be differentially expressed in fast-growing chickens and slow-growing chickens. Expression levels of genes for lipid metabolism (SULT1B1, ACSBG2, PNPLA3, LPL, AOAH) carbohydrate metabolism (MGAT4B, XYLB, GBE1, PGM1, HKDC1) cholesttrol biosynthesis (FDPS, LSS, HMGCR, NSDHL, DHCR24, IDI1, ME1) HSD17B7 and other reaction or processes (CYP1A4, CYP1A1, AKR1B1, CYP4V2, DDO) were higher in the fast-growing White Recessive Rock chickens than in the slow-growing Xinghua chickens. On the other hand, expression levels of genes associated with multicellular organism development, immune response, DNA integration, melanin biosynthetic process, muscle organ development and oxidation-reduction (FRZB, DMD, FUT8, CYP2C45, DHRSX, and CYP2C18) and with glycol-metabolism (GCNT2, ELOVL 6, and FASN), were higher in the XH chickens than in the fast-growing chickens. RT-PCR validated high expression levels of nine out of 12 genes in fat tissues. The G1257069A and T1247123C of the ACSBG2 gene were significantly associated with abdominal fat weight. The G4928024A of the FASN gene were significantly associated with fat bandwidth, and abdominal fat percentage. The C4930169T of the FASN gene was associated with abdominal fat weight while the A59539099G of the ELOVL 6 was significantly associated with subcutaneous fat. The A8378815G of the DDT was associated with fat band width. The differences in fat deposition were reflected with differential gene expressions in fast and slow growing chickens. Fat deposition is a crucial aspect in modern chicken breeding schemes because it is associated with selection for increased body weight in broilers[1–7]. The growth of broiler chicken is accompanied by an increased percentage of body fat with a concomitant increase in the mass of abdominal and visceral fat. The quantity of fat deposited increases faster and earlier in fast-growing chickens than in slow-growing chickens[9–12]. Excessive adiposity is a problem in modern broiler industry; and needs to be controlled to reduce negative effects on productivity, acceptability, and health of consumers. In meat-type chickens, excessive adipose tissue decreases both feed efficiency during rearing and the yield of lean meat after processing. However, fat is the major contributor to meat flavor; and the presence of intramuscular fat confers high eating quality of meat. Therefore, regulating fat deposition plays an important role in broiler chicken production. In birds, lipogenesis, takes place primarily in the liver whereas adipocyte serves as the storage site for triglycerides. Hepatic lipogenesis contributes 80 to 85% of the fatty acids stored in adipose tissue because lipogenic activity in chickens is much greater in the liver than in adipose tissue[16–18]. In the past decade, genetic mechanisms underlying chicken fat deposition were widely studied but few studies were conducted to determine the gene expression involved in pathways as well as mechanisms that lead to adiposity in chickens. In the present study, fast-growing White Recessive Rock chickens (WRR) and slow-growing Xinghua chickens (XH) were used to characterize specific genes for fat deposition in chickens. Global gene expression patterns within the liver and hypothalamus tissue of WRR and XH chickens were determined using Partek GS 6.4 Affymetrix Genechip® Chicken Genome Arrays and the differentially expressed genes were identified. Some of the differentially expressed genes were validated by determining their mRNA expression in liver, hypothalamus and fat tissues. The association of single nucleotide polymorphisms of the genes with chicken fat traits was also investigated. Eight WRR (4♂ + 4♀, Institute of Animal Science, Guangdong Academy of Agricultural Sciences, Guangzhou, China), and 8 XH chickens (4♂ + 4♀, Fengkai Zhicheng Poultry Breeding Company, Guangdong, China), were used for differential expression observation with microarray hybridization. All the birds were fed a nutritionally balanced corn-soybean diet. The birds had free access to water. They were slaughtered at 8 wk of age, and the liver and hypothalamus were excised, snapped frozen in liquid nitrogen and stored at -80°C until required for further analyses. Six sets of WRR (3♂ + 3♀), and another six of XH (3♂ + 3♀), were used to study mRNA expression of the SULT1B1, PNPLA3, GPAM, ELOVL6, LPL, FASN, ACSBG2, FDPS, and FRZB genes in abdominal fat, subcutaneous fat, breast muscle, and pituitary tissues in the liver and hypothalamus tissues. For association analysis, an F2 resource population was constructed by crossing WRR with XH chickens. The fat traits such as abdominal fat weight, subcutaneous fat thickness, fat band width, abdominal fat percentage were recorded in all F2 full-sib individuals. The study was approved by the Animal Care Committee of South China Agricultural University (Guangzhou, People's Republic of China). Animals involved in this study were humanely sacrificed as necessary to ameliorate their suffering. Total RNA was isolated from frozen tissues (50 mg) using TRIzol reagent (Invitrogen, CA, USA) according to the manufacturer’s instructions. Total RNA concentration was determined by spectrophotometry. The RNA labelling and microarray hybridization were carried out according to the Affymetrix Expression Analysis Technical Manual (Biochip Corporation, Shanghai, China). The arrays were scanned using the Affymetrix Scanner 3000. The GeneChip Chicken Genome Array used in the present study was created by Affymetrix Inc. (Santa Clara, USA) at the end of 2006, with comprehensive coverage of over 38,000 probe sets representing 32,773 transcripts corresponding to over 28,000 chicken genes (Chicken Genome Sequencing Consortium 2.1). Sequence information for this array was selected from the following public data sources: GenBank, UniGene and Ensembl. Data normalization was used to eliminate dye-related artifacts. Consecutive filtering procedures were performed to normalize the data, and to remove noise derived from absent genes, background, and nonspecific hybridizations. Comparisons of expression levels were performed for each gene, and genes with the most significant differential expression (P < 0.05) were retained. Raw data sets were normalized to total fluorescence, which represents the total amount of RNA hybridized to a microarray, using the Partek GS 6.4 (Affymetrix Genechip® Chicken Genome Arrays, USA). QVALUE was used to obtain false-discovery rates (FDR). The data obtained were subjected to Partek GS 6.4 for comparison using Affymetrix Expression Console Software, for expression algorithm robust multi-array (RMA) analysis. Multivariate ANOVA was used to determine significant differences among the replicates. Differentially expressed genes between WRR and XH chickens were identified by cutoff of fold-change (fold change) ≥ 2 and P < 0.05. 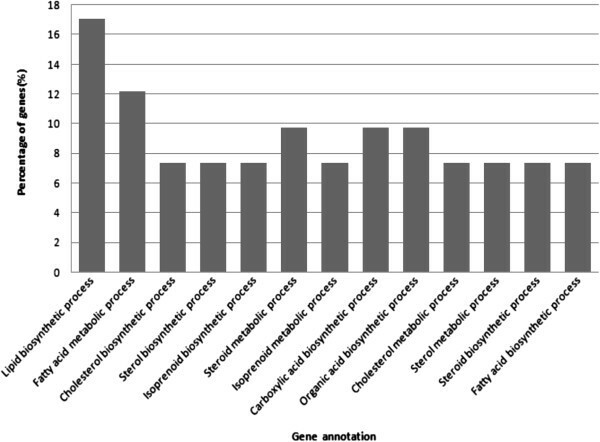 Molecular functions of differentially expressed genes were classified according to molecule annotation system (MAS) 3.0 (http://bioinfo.capitalbio.com/mas3/). Database from the Kyoto Encyclopedia of Genes and Genomes (KEGG) were used for pathway analysis on differentially expressed genes using AgriGO (GO Analysis Toolkit and Database for Agricultural Community) http://bioinfo.cau.edu.cn/agriGO/) and Database for Annotation, Visualization and Integrated Discovery (DAVID) Bioinformatics Resources (http://david.abcc.ncifcrf.gov/). The primers were designed based on the published cDNA sequences of SULT1B1, the LPL, ELOVL6, ACSBG2, SCD5, FADS1, PNPLA3, GAPDH, BEAN, SLC22A2, DDT, PLA2G12A, and 18S genes (http://www.ncbi.nlm.nih.gov) using GENETOOL software (BioTools, Alberta, Canada). The RNA was reverse-transcribed using the RevertAid Fist Strand cDNA Synthesis (Toyobo, Japan). After reverse transcription, the cDNA of the selected genes were amplified by real-time reverse transcription PCR. The relative level of each mRNA normalized to the 18 s gene was calculated using the following equation: fold change = 2Ct target (WRR)–Ct target (XH)/2Ct 18S (WRR) -Ct 18S (XH). The linear amount of target molecules relative to the calibrator was calculated by 2- ΔΔCT. Therefore, all gene transcription results are reported as the n-fold difference relative to the calibrator. Specificity of the amplification product was verified by electrophoresis on a 0.8% agarose-gel. The results were expressed as mean ± SE. The same primers as those used in validation were used for determining fat tissue expression. The real-time RT-PCR reactions were performed using the iCycler Real-Time PCR detection System. Each sample reaction was ran in triplicate and the expression quantified as the number of cycles (CT) after which fluorescence exceeds the background threshold minus the CT for the housekeeping control (ΔCT). The calculation of absolute mRNA levels was based on the PCR efficiency and the threshold cycle (Ct) deviation of unknown cDNA versus the control cDNA. The quantitative values were obtained from the Ct values, which were the inverse ratios relative to the starting PCR product. The linear amount of target molecules relative to the calibrator was calculated by 2- ΔΔCT. Briefly, the relative levels of each mRNA were expressed as the same as above. Tree variation sites were identified in intronic of chicken genes ACSBG2, FASN and ELOVL6; and one variation site was identified as non synonymous of chicken ACSBG2 and synonymous coding region of chicken DDT gene by using GENBANK (Table 1). SNP position was determined based on the reported SNP in ensembl http://www.ensembl.org/biomart/martview. ACSBG2, acyl-CoA synthetase bubblegum family member 2; FASN, fatty acid synthase; ELOVL6, elongation of long chain fatty acids; DDT, D-dopachrome tautomerase. The data for association study were analyzed by ANOVA (SAS 8.1). The statistical significance threshold was set at P < 0.05. Values were expressed as the mean ± SEM, and the differences in the means were compared using Duncan’s Multiple Range Test at 5% level of significance. After normalization and statistical analyses, 400 and 220 genes with at least 2-fold differences were identified (P < 0.05, FC ≥ 2) in liver and hypothalamus tissues of WRR and XH chickens, respectively. When fast-growing WRR chickens were compared with slow-growing XH chickens, 214 and 91 genes were up-regulated, and 186 and 129 genes were down-regulated in liver and hypothalamus tissues (Figure 1A and B; Tables 2 and3). 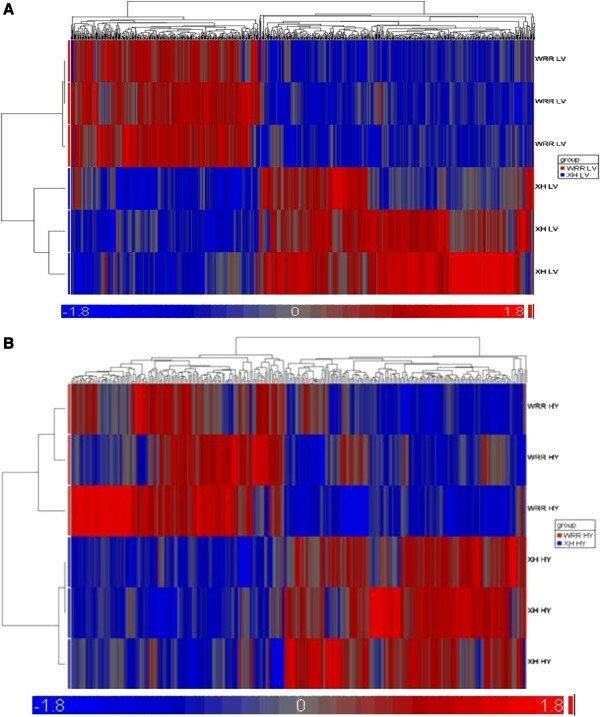 Heat maps of differentially expressed genes of FG and SG chicken during developmental stages of liver and hypothalamus tissue. A Heat map of differentially expressed genes of FG and SG chicken during developmental stages of liver tissue. The red color represents fast growing chicken (WRR) genes while the blue color represents the slow growing chicken (XH) genes. The fold changes were arranged from -1.8 up to 1.8 (P < 0.05). WRRLV means liver tissue from White Recessive chickens. XHLV means liver tissue from Xinghua chickens. B Heat map of differentially expressed genes of FG and SG chicken during developmental stages of Hypothalamus Tissue . The red color represents fast growing chicken (WRR) genes while the blue color represents the slow growing chicken (XH) genes. The all identified gene, fold changes were arranged from -1.8 up to 1.8 (P < 0.05). WRRHY means Hypothalamus tissue from White Recessive chickens. XHHY means Hypothalamus tissue from Xinghua chickens. Positive values indicated that the genes were up-regulated when fast growing WRR chickens are compared with slow growing XH chickens. Negative values meant down-regulation when comparison between WRR and XH chickens are made, Data were significantly different (P > 0,05), and fold changes were not smaller than 2. Positive values simply mean that the genes were up-regulated when WRR chickens are compared with XH chickens. Similarly, negative values mean down-regulation when comparison between WRR and XH chickens is made, Data were significantly different [P > 0, 05 (fold change ≥ 2)]. In the liver, lipid metabolism genes viz SULT1B1, ACSBG2, LPL, AACS, PNPLA3, were up-regulated while AOAH gene was down-regulated. The carbohydrate metabolism genes: MGAT4B, XYLB, GBE1, PGM1, and HKDC1, were up-regulated (Table 2; Figure 1A). The fatty acid biosynthesis genes, ELOVL6 and FASN, cholesterol biosynthesis genes, LSS, HMGCR, FDPS, DHCR24, malate metabolism process gene, ME1, proline biosynthesis process genes, PYCR2 and ALDH18A1, oxidation-reduction reactions genes, CYP1A4, CYP1A1 similar to aldose reductase, AKR1B1, CYP4V2, and DDO, cyclic nucleotide catabolic process gene, N4BP2L1, and multicellular organism development genes, SEMA5A and C1orf107, were identified highly expressed in WRR chickens. 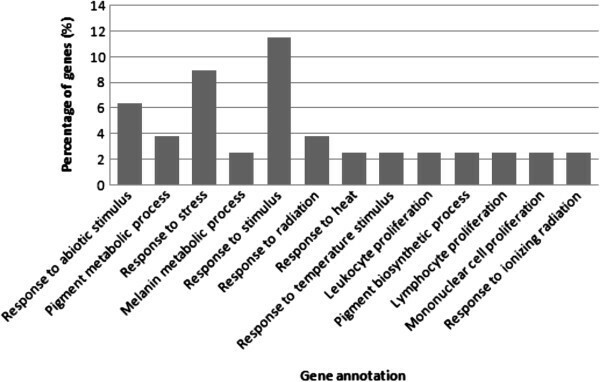 In contrast, genes highly expressed in XH chickens were associated with multicellular development, FRZB, immune response, DNA integration, melanin biosynthetic process, DDT, muscle organ development, DMD, transforming growth factor beta receptor signaling pathway, FUT8, and oxidation-reduction, CYP2C45, DHRSX, MICAL1, and CYP2C18. In addition, the genes for the biosynthesis of steroids and fatty acid, ELOVL6, and FASN were also observed highly expressed in XH chickens (Table 2; Figure 1). The metabolic process genes, ACSM5 (hypothetical protein), were down- regulated by 5- fold, while another metabolic process genes, ENPEP, were up-regulated by 5- fold (Table 2). In the hypothalamus, the cyclic nucleotide catabolism gene, N4BP2L1, was up-regulated in fast growing WRR chickens by a 3.7-fold change. The negative regulation of endothelial cell proliferation gene, TNFSF15, was up-regulated by a 2.5-fold change. The proteolysis gene, ITGBL1, the protein amino acid phosphorylation genes, SGK1 and RIPK2, are up-regulated in the WRR chickens. The copper ion transport gene, SLC31A1, was localized on chr17:1874758–1884555, and was up-regulated in the WRR chickens by a 7.3-fold change. The PODXL, RAD54B, PODXL, PMP2 and TMSB10, were up-regulated in the WRR chickens. The melanin biosynthesis gene, DDT, ion transport genes, SLC22A2, and GLRA1, lipid metabolism process gene, P20K (also known as EX-FABP), cellular amino acid metabolism gene, LOC772201, protein complex gene, ATPAF1, proteolysis genes, FOLH1, C1R, and VSP13B, striated muscle contraction gene, MYBPC2, nitrogen compound metabolism process gene, Vanin1, porphyrin biosynthesis process gene, FECH, and response to stress genes, HSP70, HSP25, and HSPB1, were down-regulated in slow-growing XH chickens. In addition, the signal transduction genes, similar to KIAA0712 protein, and ANK2, small GTPase mediated signal transduction gene, RAB30, DNA integration gene, LOC770705, amino acid phosphorylation gene, PRKD3, carbohydrate metabolic process gene, CBR1, and NAT13, neuron migration gene, MDGA1, hemophilic cell adhesion gene, PCDH24, sodium transport gene, SLC13A5, regulation of transcript DNA-dependent genes, CREB3L2, and MLL3, were also down-regulated in slow-growing XH chickens (Table 3). Different gene ontology (GO) terms for biological process were identified in the livers of WRR and XH chickens. The highest GO clustered was in lipid biosynthesis process and fatty acid metabolism process (Figure 2). The functional distribution of gene clusters of liver biological process. In hypothalamus tissue, the GO terms for biological process in the WRR and XH chickens were mostly observed in response to stimulus, response to stress, and response to abiotic stimulus. Pigment metabolic process, melanin metabolic process, response to radiation, response to heat, response to temperature stimulus, leucocyte proliferation, pigment biosynthesis process, lymphocyte proliferation, mononuclear cell proliferation and response to ionizing radiation were also observed (Figure 3). The functional distribution of gene clusters of hypothalamus biological process. In the pathway study, a number of lipid-related genes: ACSBG2, FASN, LPL, GPAM, FDPS, and others were identified. The cicardian clock gene, ARNTL also known as Bmal1, was observed. Based on the pathways, differentially expressed genes participated in several function related to lipid (Tables 2 and4). The lipid related genes were ACSBG2, SULT1B1, and LDLR of lipid metabolism, LPL of glycerolipid metabolism, and MTTP of lipid transporter activity, FASN and ELOVL6 of biosynthesis of unsaturated fatty acids, LSS, HMGCR, NSDHL, DHCR24, IDI1, of HSD17B7 of biosynthesis of steroid, AGPAT4 and FRZB of triacylglyceride synthesis, GPAM of glycerolipid metabolism, PHOSPHO1 and PTDSS1 of glycerophospholipid metabolism, ATP6V1C2 of oxidative phosphorylation, ACSS2 of glycolysis, GCNT2 of glycosphingolipid biosynthesis – lactoseries, and ME1 of pyruvate metabolism (Figure 3). In hypothalamus tissue, three genes related to VEGF signaling pathway, four genes related to MAPK signaling pathway, one gene each related to alpha-linolenic acid metabolism, nitrogen metabolism, linoleic acid metabolism, porphyrin and chlorophyll metabolism were identified. Then a homologous recombination, heparan sulfate biosynthesis, ether lipid metabolism, arginine and proline metabolism, arachidonic acid metabolism, N-glycan biosynthesis, glycerophospholipid metabolism, ErbB signaling pathway, Wnt signaling pathway were also observed in our present study (Table 5). The mRNA levels of 9 genes involved in fat deposition were further quantified using real-time RT-PCR (Table 6). The level of 18S rRNA was chosen as reference and confirmed to be invariable. The expression levels (normalized to 18S) of the 9 genes were determined. Fold changes of gene expression determined by real-time RT-PCR were compared with the fold changes obtained from microarray analysis (Table 6). The highest fold changes in WRR chickens compared with XH chickens were confirmed in the SULT1B1, ACSBG2, ELOVL6, SLC31A1, and PNPLA3 genes. The lowest fold-changes were observed in the DDT and BEAN genes. Validation of differentially expressed genes between WRR and XH chickens by RT-PCR. The data presented indicate the relative mRNA expression of both microarray and qRT-PCR. Positive values mean that the gene was up-regulated when WRR chickens were compared with XH chickens. Similarly, a negative number means that the gene was down-regulated. When WRR males were compared with XH males, the expression of the LPL, FDPS, PNPLA3, GPAM, and SULT1B1 genes were up-regulated, and the FASN, ACSBG2, and FRZB were down-regulated in the abdominal fat tissue (Figure 4). In the subcutaneous fat tissue, the LPL, FDPS, PNPLA3, and SULT1B1 were up-regulated, and the FASN, GPAM, ACSBG2, and FRZB genes were down-regulated. In the breast muscle tissues, the FDPS, PNPLA3, GPAM, and FRZB were up-regulated, and the LPL, FASN, ACSBG2, SULT1B1, and ELOVL6 genes were down-regulated (Figure 4). In the pituitary tissues, the LPL, FASN, SULT1B1, and ELOVL6 genes were up-regulated, and the FDPS, PNPLA3, GPAM, ACSBG2, and FRZB genes were up-regulated (Tables 7,4 and5). Data presented indicate the different mRNA gene relative expressions (as fold changes) of FG and SG male chicken relative to different fat tissues. Error bars represent the standard errors. Positive values imply genes were up-regulated in fast-growing chicken compared to slow-growing ones. The SNP rs10731268 of the ACSBG2 gene was associated with abdominal fat weight (P = 0.005), and abdominal fat percentage (P = 0.022). The SNP rs15248801 of the ACSBG2 gene was associated with abdominal fat weight (P = 0.039) [Table 8]. The SNP rs15822158 of the FASN gene was associated with fat band width (P = 0.0003), abdominal fat percentage (P = 0.001), and abdominal fat percentage (P = 0.005) [Table 9]. The SNP rs15822181 of the FASN gene was associated with abdominal fat weight (P = 0.049) while the SNP rs16418687 of the ELOVL6 gene was associated with subcutaneous fat (P = 0.034). The SNP rs14092745 of the DDT gene was associated with fat band width (P = 0.048) [Table 9,10]. Means with different letter are significantly different ** (P > 0.01); * (P > 0.05). Data are presented at least square means ± SE. The number shown in parentheses stands for the selected individuals. Means with different letter are significantly different ** (P > 0, 01); * (P > 0,05). The approach of selective-fat-deposition-related-genes in animals is a relatively new strategy aimed at improving production efficiency while enhancing meat quality. Efforts to reduce fat deposition in animals include genetic selection, feeding strategies, housing and environmental strategies as well as hormone supplementation. While these efforts have improved production efficiency and reduced carcass lipid deposition, negatively impacts on meat quality were due to reduced intramuscular fat deposition. Based on the comparison of two types of breeds of chicken whose fat deposition and growth rate are exceptionally varied, a functional genomics approach was chosen in order to identify chicken fat-deposition-related-genes. In this genomic approach, liver tissue was used. The liver is the site of fat synthesis, and hypothalamus, which is a major gland for the endocrine system. Few studies focused on global gene expression surveys in chickens. Wang et al. provided analysis of chicken adipose tissue gene expression profile. Other hepatic transcriptional analyses had been reported, using dedicated chicken 3.2 K liver-specific microarray[14, 23] or a 323 cDNA microarray. Differential gene expressions in liver during the fat developmental stage in fast growing WRR and slow growing XH chickens were related to lipid metabolism in our study. It has been reported that some genes, e.g. 3-hydroxyacyl-CoA dehydrogenase, long chain acyl-CoA thioesterase, fatty-acid elongation enzymes and cytosolic fatty-acid- and acyl-CoA-binding proteins, are known to play key roles in mammalian fat or lipid metabolism. Glyco-metabolism such as glycol-sphingolipids (GCNT2), biosynthesis of steroids, fatty acid biosynthesis (ELOVL6 and FASN) was observed in this study. Collin et al. reported that fast growing chickens developed excessive adiposity besides the high muscle mass resulting from selection. The suggestion is that differential expression of the lipid metabolism related genes might be one of the factors in the differences of fat deposition between fast growing and slow growing chickens at the developmental stage. The liver is the main site for fatty acid biosynthesis and the fatty acids are then transported to the adipose tissue for storage. The tasks are accomplished through the generation of triglycerides by the liver from fatty acids and L-a-glycerophosphate, packaged into very low density lipoproteins (VLDL), and then, secreted into the blood. The triglycerides in VLDL are processed by the adipose tissue and finally deposited in the central vacuole of the adipocyte. It was suggested that several mechanisms regulate intracellular non-esterified fatty acids composition, including fatty acid transport, acyl CoA synthetases, fatty acid elongases, desaturases, neutral and polar lipid lipases and fatty acid oxidation. Most of these mechanisms are regulated by PPAR alpha or SREBP-1c. Together, these mechanisms control hepatic lipid composition and affect whole-body lipid composition. LPL catalyzes the hydrolysis of plasma lipoproteins, which is a rate-limiting step in the transportation of lipids into peripheral tissues[28, 29]. The LPL gene expression in fast growing chicken was 2.5-fold greater than that in the slow growing type at the developmental stage in this study. In mammals, increased LPL activity is strongly associated with fat deposition and obesity, and these are regulated by both insulin and glucocorticoids according to Fried et al.. The major site of lipogenesis in birds, however, is the liver rather than the adipose tissue. The role of fatty acid-binding protein in the intramuscular trafficking of long-chain fatty acids within intramuscular adipocytes has been studied and found to be related to intramuscular levels in different species[32, 33]. Fatty acid synthesis (FAS) occurs during periods of energy surplus and concomitantly its gene expression is down-regulated during starvation in the liver, which is the major site of lipogenesis in avian species[35–37]. The regulation of hypothalamic fatty acid synthesis gene expression in response to starvation is similar to that of liver fatty acid synthesis. In birds, like in humans, fatty acid synthesis primarily occurs in the liver. Demeure et al. reported that chicken FASN gene is directly the target of liver cross receptor (LxR) alpha and therefore, expands the role of LxR alpha as a regulator of lipid metabolism. FASN and GPAM are two enzymes that play central roles in de novo lipogenesis. The G4928024A of the FASN gene is significantly associated with fat band width, abdominal fat percentage, and abdominal fat percentage. The DDT gene was observed down-regulated in both tissues when fast growing WRR chickens were compared with slow growing XH chickens. This gene has function in melanization which can play a role in the pigmentation of abdominal fat. It also, has a high correlation with the accumulation of melanin in the skin of the shanks. Melanization of abdominal fascia is not harmful but it may cause severe economic losses to the producer. It was surprising to observe that the FDPS, LSS, HMGCR, NSDHL, DHCR24, IDI1, and HSD17B7 were up-regulated in fast growing WRR chickens. These genes are considered as the ones which has some functions in cholesterol biosynthesis. The glycolytic genes (ACSS2), carbohydrate metabolic and fatty acid biosynthesis were also up-regulated in the WRR chickens. It is suggested that the genes related to cholesterol biosynthesis, carbohydrate metabolic and fatty acid biosynthesis may have influence on fat development. This study also showed that the genes related to proline biosynthetic process, member 2 of pyrroline-5-carboxylate reductase family, member A1 of aldehyde dehydrogenase 18 families, and oxidation reduction, CYP1A4, CYP1A1, AKR1B1, CYP4V2, DDO, and similar to aldose reductase, were differently expressed between the WRR and XH chickens. The CYP2H1, CYP2C45, CYP2C18, MICAL1 and CYP3A37 genes were significantly different in between the WRR and XH chickens. In this study, many lipid-related genes were identified, ACSBG2, FASN, LPL, GPAM, and FDPS. The cicardian clock gene (ARNTL) was observed, it plays a role in glucose, lipid metabolism and adipogenesis[39–41]. Moreover, a network of 11 genes, LPL, ACSBG2, AACS, FASN, LSS, FDPS, SULT1B1, HMGCR, DPP4, FUT8, and PLAU, was observed. Parallel expression patterns of these functionally relevant genes provided strong evidence for their coordinated involvement in lipid biosynthesis, cholesterol biosynthesis and fatty acid degradation in chickens. In chickens, the ACSBG2 gene has been found to play a significant role in lipid metabolism. The present study confirmed this conclusion. In order to support the results of the microarray study, all the genes used for the mRNA assay were found to have good relationship with fat-related genes as their functions related to lipid metabolism, cholesterol biosynthesis and fatty acid metabolism. Interestingly, the SULT1B1, PNPLA3, GPAM, ELOVL6, LPL, FASN, ACSBG2, FDPS, and FRZB genes were preferentially expressed in 4 fatty tissues of abdominal fat, subcutaneous fat, breast muscle and pituitary gland when WRR were compared with XH chickens. However, PNPLA3 mRNA level was higher in all tissues in WRR except pituitary tissue, where it expressed lower levels in XH chicken. PNPLA3, also referred to as adiponutrin, was originally identified as a highly adipose–specific transcript that rapidly responds to nutritional status. The microarray assay demonstrated that there was a 3 times higher expression of the PNPLA3 gene in liver tissue at 8 wk of age in WRR than in XH chickens. It could be concluded that the PNPLA3 gene is involved in fat deposition. The microarray data showed that the SULT1B1 is abundantly expressed in liver tissue with 7 fold change in WRR with XH chickens. The gene was reported to be expressed in liver and other numerous extra-hepatic tissues. FDPS is an important intermediate in cholesterol and sterol biosynthesis, a substrate for protein farnesylation and geranylgeranylation, and a ligand or agonist for certain hormone receptors and growth receptors. In this study, the FDPS was found to belong to the cholesterol biosythetic group. The FDPS mRNA level was higher in subcutaneous fat and pituitary tissue of WRR female chicken against XH counterpart. The GPAM gene plays a vital role in the regulation of cellular triacylglycerol and phospholipid levels[44, 45]. In this study, adipose tissues such as abdominal fat and subcutaneous fat were found to have the highest levels of GPAM mRNA expression whereas it was rarely detectable in the liver in the microarray assay. The FRZB gene (also known as SFRP3) is a member of the secreted frizzled receptor family of soluble proteins which binds to and antagonises Wnt receptor. Wnts are secreted lipid-modified signaling proteins that influence multiple processes in the development of animals. The FRZB was shown to play a major role in adipogenesis in the microarray analysis of WRR and XH at 8 wk of age. ELOVL6 is involved in de novo lipogenesis and is regulated by dietary, hormonal and developmental factors. In this study, ELOVL6 mRNA level was higher in all tissues of XH chickens than of WRR chickens. LPL is a glycoprotein enzyme that is produced in several tissues of mammals such as adipose tissue, skeletal muscle, heart, macrophages and lactating mammary gland, but not in the liver of adults[48, 49]. In chickens, LPL hydrolyzes lipids in lipoproteins, such as those found in chylomicrons and very low-density lipoproteins (VLDL) into three free fatty acid molecules and one glycerol molecule[29, 50–52]. In studying the deposition of fat in the abdominal fat pads of chicken, it has become clearer that LPL-catalyzed hydrolysis of triacylglycerol in adipose tissue is a rate-limiting step in fat accumulation. Therefore, the transport and incorporation of exogenous lipids, i.e. plasma VLDL lipoprotein and portomicron, are essential for the deposition of cytoplasmic triglycerides in abdominal adipose tissue. These are characteristics of lipid metabolism in avian species since lipogenic activity is much greater in the liver than in adipose tissue[28, 53, 54]. This study showed that the LPL gene expression was significantly higher in fast-growing chickens than in slow-growing chickens. The association study provides direct evidence of genes related to fat deposition. In our association study, the A59539099G of the ELOVL6 gene was significantly associated with subcutaneous fat. The A8378815G of the DDT gene was associated with fat band width. The C4930169T of the FASN gene was also found to be associated with abdominal fat weight. G1257069A and T1247123C of the ACSBG2 gene were significantly associated with fat traits. The above results further confirmed that the ELOVL6, DDT, FASN, and ACSBG2 genes are related to chicken fat deposition. The differential genes expressions in fast and slow growing chickens show differences in fat developmental stage which is supported by lipid-related genes identified and characterized in these two types of chicken. The findings indicate that the variation of the ACSBG2, FASN, ELOVL 6, and DDT genes were significantly associated with fat deposition. Funds for this work were partly provided by The Ministry of Higher Education Student Financing Agency of Rwanda, China Scholarship Council and South China Agricultural University, Guangzhou, China. Further support was provided by the Major State Basic Research Development Program, China (project no. 2006CB102107), and the National High Technology Research and Development Program of China (863 Program, project no. 2007AA10Z163). HCA is a correspondence author, conducted all the experiments and written and approved the final manuscript. WP participated in data analysis and approved the final manuscript. SX participated in data collection, laboratory experiment and approved final manuscript. JX participated in data collection, laboratory experiment and approved final manuscript. ZR participated in data collection, laboratory experiment and approved final manuscript. SL corried out the data analysis and approved final manuscript. ZX guided in gene expression analysis and approved final manuscript.